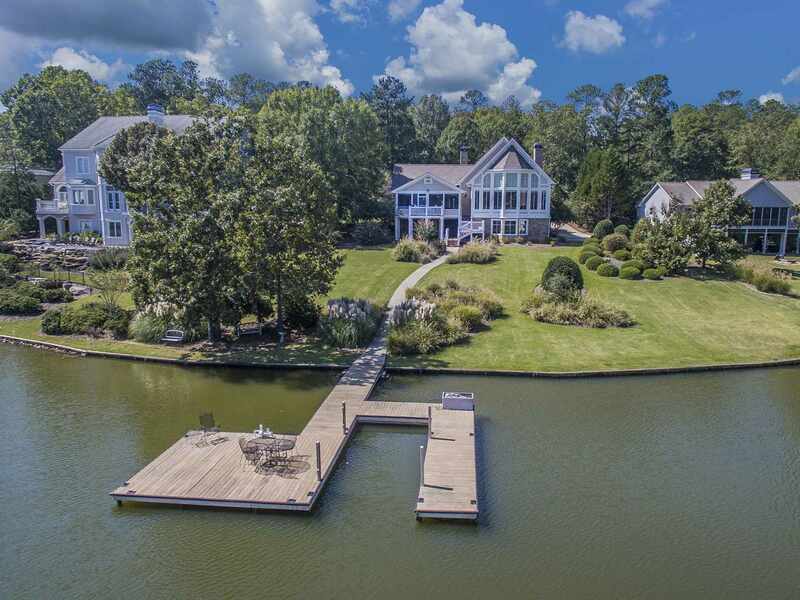 BEST OF BOTH WORLDS WITH THIS BEAUTIFUL LAKE HOME IN THE LANDING AT REYNOLDS LAKE OCONEE. YOU'LL ENJOY HUGE VIEWS OF BOTH LAKE OCONEE AND THE LANDING GOLF COURSE FROM MOST AREAS IN THE HOME. THE IMPRESSIVE GREAT ROOM WITH SOARING CEILING, FLOOR TO CEILING LAKESIDE WINDOWS AND STONE FIREPLACE IS WIDE OPEN TO THE UPDATED KITCHEN AND FULLY EQUIPPED PUB AREA THAT OVERLOOKS THE LAKE AND COURSE. THIS HOME IS IDEAL FOR ENTERTAINING LARGE OR SMALL GROUPS OF FAMILY AND FRIENDS. THE MAIN LEVEL MASTER BEDROOM BOASTS A FIREPLACE AND LUXURIOUS BATH WITH HIS AND HER VANITIES, JETTED TUB, SEPARATE SHOWER AND BIDET. YOU'LL FIND ANOTHER LARGE BEDROOM AND FULL BATH ON THE MAIN LEVEL, AS WELL AS HALF BATH. UPSTAIRS IS A LARGE PRIVATE BEDROOM WITH BALCONY, FULL BATH AND LOFT LIVING AREA. ON THE TERRACE LEVEL IS A BEDROOM SUITE WITH PRIVATE BATH AND LIVING AREA. 3 CAR GARAGE WITH WORK SHOP AND LOADS OF STORAGE. HUGE LAKESIDE SCREENED PORCH WITH GRANITE BAR AREA. AT THE LAKE IS MAX DOCK AND DEEP WATER. THIS IS A MUST SEE HOME IN THIS WORLD CLASS COMMUNITY WITH 6 GOLF COURSES, 4 MARINAS, 6 RESTAURANTS, AMAZING TENNIS FACILITIES, LAKE CLUB AND SO MUCH MORE. SELLER WILL MAKE GOLF MEMBERSHIP AVAILABLE. 1120 CLUB COVE DRIVE #1120, Greensboro GA 30642 is a Home, with 4 bedrooms which is recently sold, it has 4,230 sqft, 12 sized lot, and 3 Car Attached parking. A comparable Home, has 4 bedrooms and 3 baths, it was built in and is located at 1041 STARBOARD DRIVE #1041 Greensboro GA 30642 and for sale by its owner at $ 470,000. This home is located in the city of Greensboro , in zip code 30642, this Greene County Home, it is in the RP - THE LANDING Subdivision, and Deerfield are nearby neighborhoods.